← Don’t panic, Mr Boles! 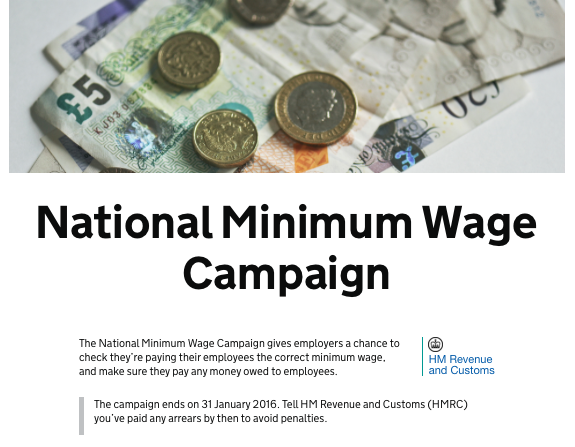 Something very unusual has been going on with enforcement of the national minimum wage. 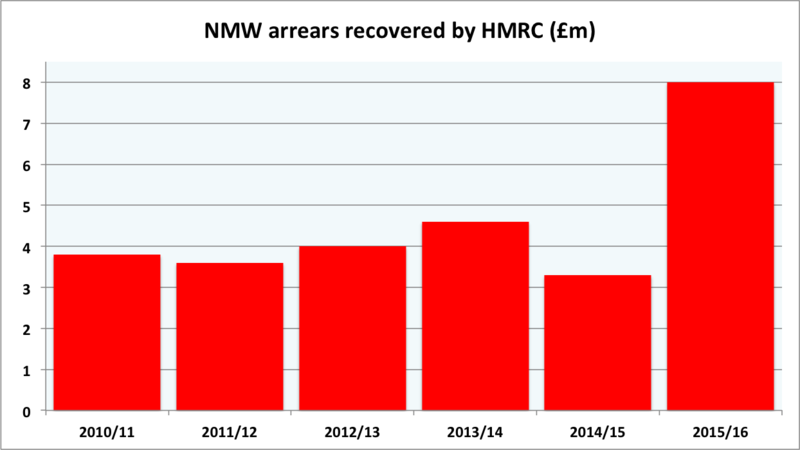 As the following table shows, over the past five years HMRC has recovered an average of £3.9 million in arrears for an average of 23,147 workers. And the figures for both arrears recovered and workers involved have been pretty steady, year on year. Certainly, no variation worthy of a Wonky graph (sorry, Gem). Source: Table 13, Final Government evidence for the Low Pay Commission’s 2016 report, BIS, January 2016. As the Minister helpfully added, “this is already the largest amount of arrears identified in any single year since the introduction of the NMW”. Indeed, despite the number of employers involved (“over 500”) being par for the course at this stage of the financial year – HMRC took action against 735 employers in 2014/15, 680 in 2013/14, and 736 in 2012/13 – that £8m (in seven months) is more than twice the average arrears recovered in recent years, and 46,000 workers (in seven months) is twice the average number of workers (23,147). What’s more, in early September last year, BIS minister Nick Boles told MPs that “since 7 March 2014” – that is, over the previous 18 months – HMRC had recovered “almost £5.9m”. As HMRC recovered £3.3m in the financial year April 2014 to March 2015, that implies recovery of some £2.6m between April and August 2015 – a bit more than normal, for sure, but nothing extraordinary. And, set against David Gauke’s answer today, that in turn implies that HMRC recovered a whopping £5.4m in the three-month period September to November 2015. Hold on Gem, that graph may be coming. Earlier this month, we learnt that HMRC recovered no less than £1.74m of arrears from security firm TSS (Total Security Services) Ltd at some point in the past year or so. That is, by some distance, the largest (reported) sum ever recovered by HMRC from a single employer, yet still only covers 2,519 workers. This might explain that above average figure of £2.6m recovered between April and August 2015. Or it might be part of that £5.4m seemingly recovered between September and November 2015. Even in the latter case, that leaves an as yet unexplained recovery of some £3.7m of arrears in just three months in the autumn of 2015. Together with an as yet unexplained 20-25,000 more workers than than we might reasonably expect over a seven-month period. So, could it be that, in the autumn of 2015, one or two large employers took advantage of this effective ‘amnesty’ to cough up a total of some £3.7m in arrears (or some £5.4m, if TSS Ltd’s £1.74m is part of the £2.6m recovered earlier in the year) and so avoid as much as £3.5m (or £5.4m) in financial penalties – reduced by 50% for prompt payment – and BIS naming & shaming? As well as, it must be assumed (since it wasn’t mentioned on the ‘amnesty’ webpage), the possibility of criminal prosecution for ‘serious’ breaches of the NMW? How convenient. And could one of those employers be Sports Direct, which – according to the Guardian – employs about 15,000 workers on low-paid, zero-hours contracts, together with another 4,300 low-paid agency workers? And which, following an undercover operation by Guardian journalists, suddenly announced in December that it is stumping up £10m per year from now on to ensure compliance with the NMW? Or could it be that HMRC is finally getting to grips with the long-standing, systemic flouting of the NMW in the social care sector? Last month, for example, the BBC reported that “about 100 home care workers in Swansea and Carmarthenshire are to be paid up to £2,500 each” in NMW arrears, after MiHomecare had been found to have not been paying its employees to travel between clients. MiHomecare reportedly employs some 6,000 care workers nationally – and why would it have been paying its care workers in Swansea and Carmarthenshire any differently to those in other parts of the country? 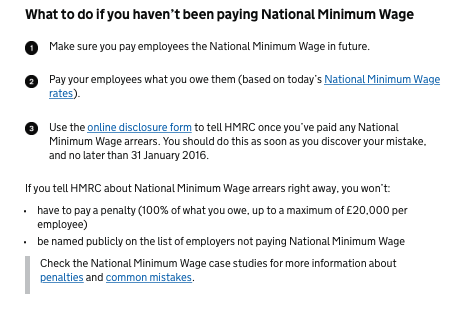 Being a humble policy minion, I have no idea – and I’m told that Sports Direct employees know nothing of any NMW arrears that might be coming their way. But David Gauke and Nick Boles must know. And, if they are as committed to ensuring compliance with the NMW as they profess, they really ought to tell us. And explain this graph. @wonkypolicywonk is a policy minion who has been lucky enough to work at Maternity Action, Working Families, Citizens Advice, the National Audit Office, the Law Society, and Amnesty International UK. He currently bangs his head on a desk in Parliament. This entry was posted in Workers' rights and tagged Enforcement, National minimum wage, Sports Direct. Bookmark the permalink.